Strategies to protect librarians from harassment. What are the top 100 novels of all time? What makes a novel “great”? At OCLC, we believe literary greatness can be measured by how many libraries have a copy on their shelves. 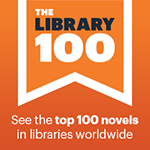 We’ve identified 100 timeless, top novels—those found in thousands of libraries around the world—using WorldCat, the world’s largest database of library materials. How many have you read? Check out The Library 100 today and see!